RAF Vickers Wellington medium bombers flying in formation, circa 1940. National Archives of Canada, PA-128144. Military aircraft of the 1930s could easily cross the short distance between Nazi Germany and the British Isles. The Luftwaffe’s rearmament decided by Hitler was, therefore, a source of major concern for the British. It was to counter that threat, that in July 1935 the British Government established Bomber Command, a Royal Air Force (RAF) command whose mission it was to set up an important force ready for strategic bombing. 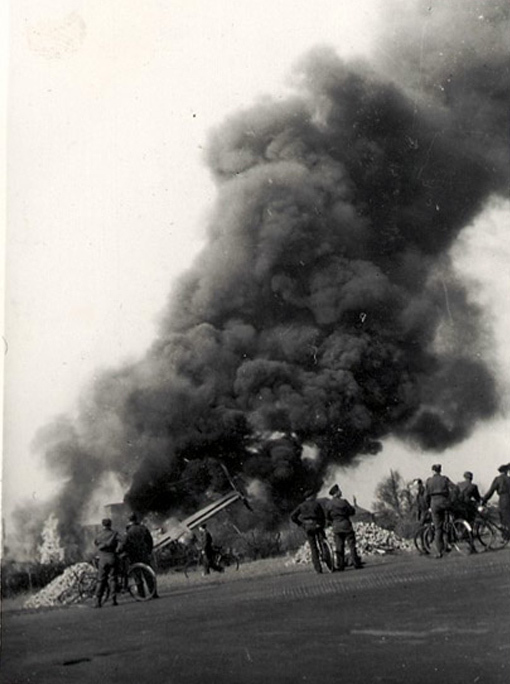 Halifax “J” of No 432 Squadron crashed at take-off at East Moor, Yorkshire, April 16th, 1945. The pilot, F/L W.H. Porritt, was killed but the other crewmembers were able to escape the flaming wreck. Gérard Pelland Album. By kind permission of the Pelland family. Between the two world wars, advances in aeronautics were such that a theory was born, claiming that, with aircraft flying increasingly faster and higher, no country could survive systematic high-explosive and incendiary bomb strikes. Pre-emptive, offensive bombing, that would crush the enemy before it can engage in such action, was therefore deemed to be the only way to escape utter destruction. The doctrine of strategic bombing resulted from that theory. Strategic bombing. Starting in July 1940, such raids became a reality, as German bombers attacked Britain. It is only after the end of the Battle of Britain that the Allies would, in their turn, assume the offensive and launch bombing raids against Germany. Early bombing raids were flown by day. They proved to be almost suicidal, as the bombers were no match for the faster and more manoeuvrable German fighters. Just as the Luftwaffe’s Dorniers 17, Junkers 88 and Heinkel 111 bombers did not stand a chance against the Spitfires, in the same way Bomber Command’s Wellingtons and Hampdens could not escape the Messerschmitts 109 that guarded the Third Reich’s air space. The RAF soon switched to night bombing as the only way to avoid enemy fighters. 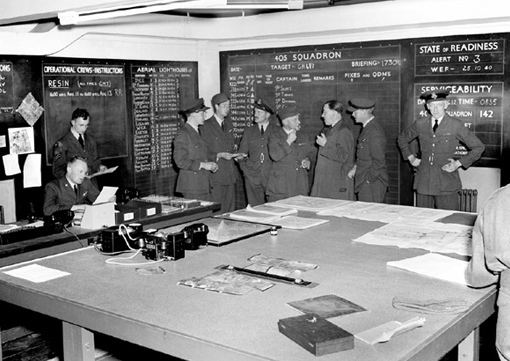 The Operations Room of RCAF No 405 Squadron, in 1941. National Defence Image Library, RE 74-385. Allied bombers had to cross Germany’s daunting anti-aircraft defence lines in order to reach their targets, as well as on their way back home. To optimize the destructive effects of bombing and reduce casualties, heavier, longer-ranged, four-engine Halifax and Lancaster bombers gradually replaced the earlier twin-engine bombers. Those air raids deep inside German territory were conducted with large numbers of aircraft, at times more than a thousand bombers flying at high altitude and moving on in successive waves under the cover of the night. Germany fought bitterly to defend its territory, using fighters, anti-aircraft artillery and a whole range of detection and scrambling devices. Both sides conducted intensive research work to improve radars and counter-measures against enemy technologies; all this made the bomber war a form of sophisticated electronic warfare. German Anti-Aircraft Defences. Part of the Skipton-on-Swale Air Base facilities, in Yorkshire, where No 424 and No 433 Squadrons were stationed. 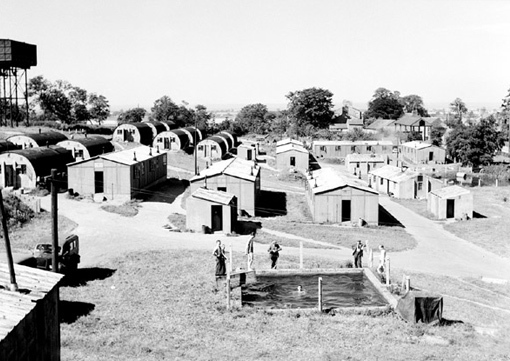 The Nissen huts with their curved, corrugated iron roofs were used as lodging quarters, August 10th, 1945. Part of the Skipton-on-Swale Air Base facilities, in Yorkshire, where No 424 and No 433 Squadrons were stationed. The Nissen huts with their curved, corrugated iron roofs were used as lodging quarters, August 10th, 1945. National Defence Image Library, PL 45597. The success of a bombing mission rests on three factors: the capacity to enter enemy territory while withstanding fire from anti-aircraft defences, the accuracy of navigation and target identification, and the quantity and efficiency of the bombs dropped on the target. Aircraft, Bombs and Radars. With each mission, some aircraft were reported missing. Every night, bombers were hit by Flak or shot down by German fighters. Some would crash at take-off or collide with a friendly plane. Landing on cluttered airstrips in bad weather conditions was also a risky business. Every night, flying crews learned that some of their pals had gone missing: dead, wounded or prisoners in Germany. After each mission, Bomber Command estimated the loss ratio, the percentage of lost aircraft in relation to the total number of aircraft involved. A squadron that suffered losses of 5% and over on several occasions was assigned to less dangerous missions such as mine-laying in the Bay of Biscay or the North Sea, to give its crews a chance to rest and train. ESSEN was attacked a second time in the course of the month on the night of March 12th. All eleven R.C.A.F. squadrons participated in this raid, contributing a total of 113 aircraft, of which 89 attacked the target and three were reported missing. Bomber Command, Secret Narrative, March 1943. Airmen from Commonwealth countries – Canada, Australia, New Zealand – as well as free forces of occupied nations flew on Bomber Command missions, or worked with ground crews. Many, including a significant number of Canadians, were incorporated into RAF squadrons. The Allied dominions, such as Canada, also had their own squadrons within Bomber Command’s structure. 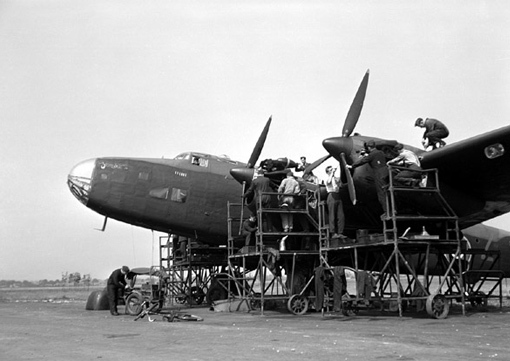 The ground crew doing maintenance work on a Halifax II of No 408 Squadron at Leeming, August 10th, 1943. National Defence Image Library, PL 19510. The Canadian government shared the British view with regard to strategic bombing. As a result, the Royal Canadian Air Force (RCAF) assigned more squadrons to Bomber Command than it did to Fighter Command or to Coastal Command. In all, 15 Canadian squadrons were formed within Bomber Command in Great Britain, with British Commonwealth Air Training Plan (BCATP) graduates; the first one was No 405 Squadron in April 1941. This significant number of squadrons helped Canada ensure the autonomy of its national air force. Indeed, on January 1st, 1943, the RCAF squadrons were brought together as 6 Group, under the command of Air Rear-Marshal G.E. Brookes, with its HQ at Allerton Hall, a Yorkshire mansion. In 1945, the group controlled 11 air bases in Yorkshire : Croft, Dalton, Dishforth, East Moor, Leeming, Linton-on-Ouse, Middleton St. George, Skipton-on-Swale, Tholthorpe, Topcliffe and Wombleton. Attended two briefings yesterday to make it probably the most interesting day up here. The first covered the 1000-plane raid on Caen, opening the way for the new offensive. After their operational supper at midnight, the crews slipped off quietly, in two’s and three’s, to the interrogation hut for their briefing. There are no good wishes or parting jokes passed around … F/L F.H.C. Reinke’s Diary, July 19th, 1944. The creation of 6 Group gave Canadian senior air force officers the opportunity to gain the experience, and operational and administrative expertise that was required to command larger and more complex units above the squadron or wing level. From its inception, 6 Group took part in Bomber Command operations against U-boat bases in Lorient and Saint-Nazaire in France, and later against urban and industrial centres in Germany targeted for night bombings. During its first few months, 6 Group displayed some evidence of its lack of experience, with a higher loss ratio than other groups, reaching 7.8% in June 1944, for instance. Maintenance problems and the number of crews reported as LMF (Lack of Moral Fibre) were lightly higher than the average for other groups. During its first 12 months, 6 Group grew from 8 to 13 squadrons; flew 7,355 missions and dropped 13,630 tons of bombs. 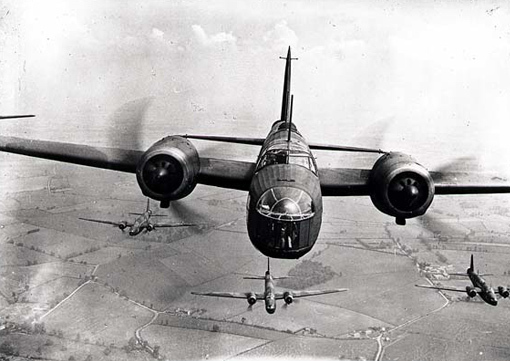 The additional training demanded by the Canadian commanders and the experience gained through perilous missions over Germany allowed 6 Group to substantially improve its performance and reduce its loss ratio to a level equivalent to that of other Bomber Command groups. The efficiency of ground crews and the quality of their maintenance work were considered outstanding. Among the Canadian squadrons, No 405 distinguished itself by the accuracy of its bomb aiming and was designated for target-indicator operations; in April 1943; while remaining affiliated to 6 Group, it was transferred to 8 Group (Pathfinder). 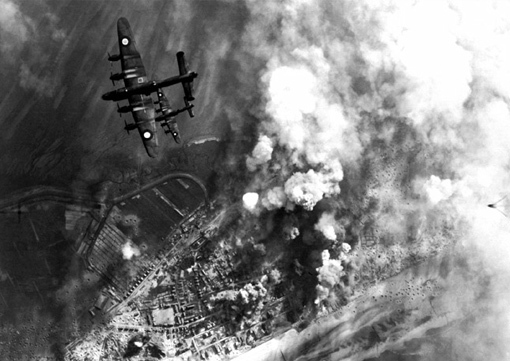 6 Group’s last bombing raid against the coastal batteries in Wangerooge, on the Friesian Islands, on April 25th, 1945. Five Canadian crews were lost following a chain collision. National Defence Image Library, PL 144281. In addition, 331 Wing, that included No 402, 424 and 425 Squadrons, was assigned to another theatre for a short while: in May 1943, it was detached from 6 Group to take part in Operation Husky, the Allies’ invasion of Sicily. Men received shots for tropical diseases and their aircraft, Wellingtons Mark X, were especially prepared to deal with dust, sand and heat. Assigned to the Mediterranean theatre’s Air Command, the three squadrons were based near Kairouan in Tunisia. 331 Wing was to stay only three months in the Mediterranean but Operation Husky was a success and the Allies decided to press on and march on Naples through Southern Italy. As a result, the three RCAF squadrons remained until October 1943. They were then reintegrated into 6 Group. No 425 Squadron, one of the three that took part in the Campaign of Italy, had the noteworthy characteristic of being made up mostly of French-Canadians. By establishing this squadron, the Canadian Government wanted to lift the language barrier that kept many Quebeckers and Francophones from other parts of Canada from enlisting in the RCAF where English was the sole operational language. No 425 was formed at Dishforth in June 1942 under the command of W/C J.M.W. St-Pierre; it started flying in August and became operational in October of the same year. When war ended in Europe on May 8th, 1945, 6 Group took part with other Bomber Command squadrons in Operation Exodus, the repatriation of war prisoners to England. Then 6 Group was dismantled : eight squadrons (No 405, 408, 419, 420, 425, 428, 431 and 434) were chosen for Tiger Force, the final assault against Japan. Starting May 31st, 1945, they flew back home with their Canadian-made Lancasters X. But the war in the Pacific came to an end before the Canadian squadrons had a chance to get involved. The squadrons that remained in Great Britain were disbanded in the twelve months following V-E Day. During its short life, 6 Group flew 40,822 missions in all; 814 crews never made it back, a 1.9% ratio. Some one hundred others crashed on British soil. A total of 9,919 RCAF airmen died while serving with Bomber Command, whether in 6 Group or in some other unit. This figure represents three-quarters of the RCAF’s 13,498 WWII casualties.